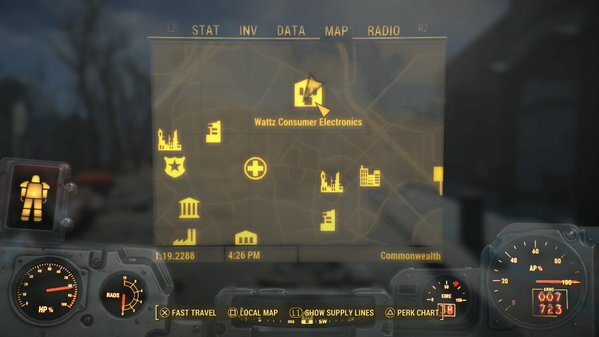 - Wattz Consumer Electronics is located in roughly central Commonwealth territory, several blocks northeast of the Cambridge Police Station. It’s not a long walk, but the neighbourhoods in-between are rough enough that you should watch yourself. Probably not a great trip to make if you just started the game, given the danger of Ghouls and Raiders. Head northwest from Wattz and you’ll find what looks like the remains of a small military blockade. Among the blockade is a Power Armor suit in a small, Advanced locked shelter that requires some hacking skills to open. - Upon entrance you’ll find a big ‘ol hole in the floor, and if you step too far forward you will fall into said hole. You can get back up from the second floor, but it’s easier to just not fall. - Take a right from the entrance and shimmy along the wall to more stable ground. You’ll find stairs and a few rooms over here with little of interest besides a bunch of crafting items. You’ll also find an idling Mr Handy. It registers as an enemy if you V.A.T.S. it, but neither the Handy nor any of the other idling robots hereabouts will defend themselves if attacked. This makes Wattz a rather nice play for collecting technology-related crafting stuff. - There are three locked doors on this floor, each of varying degrees of difficulty, and the only one that’s really useful is the Expert security door located over the cash register booth. Inside you’ll find a ton of Pre-War Money, a Mini Nuke, and a Stealth Boy. There’s also an unlocked office, up the stairs near the bathroom, which contains a trunk full of ammo, a wall safe, and a terminal. The terminal can both open the wall safe and ‘disable military protocols’, though, uh, the message when you try to disable these protocols kinda says it all. - Move down two floors, to the steel containers at the bottom. There’s a side room down here with a terminal-locked door inside. Pop the door open and you’ll find a small office - apparently belonging to a single Radroach - with, among other things, another terminal. It contains an option for ‘demo mode’. Check the terminal’s desk for a copy of Total Hack, and look in the corner of the room furthest from the door for a well-hidden Expert floor safe before you leave. - Assuming you turned on demo mode, the robots in Wattz will now be active - and they’re in military mode! Huzzah! You can now proceed to fight your way back through the store, as there’s nothing else to find, besides the insides of the robots you get to kill along the way.